In this interview for Asia Photo Review, Hon Hoang interviewed Dr. Dirk Schlottmann, an Ethnologist, Visual Anthropologist and Photographer from Berlin, Germany. Thank you to Dr. Dirk Schlottmann, for the permission and use of his photographs. Why did you decide on photography as a medium to tell your stories? 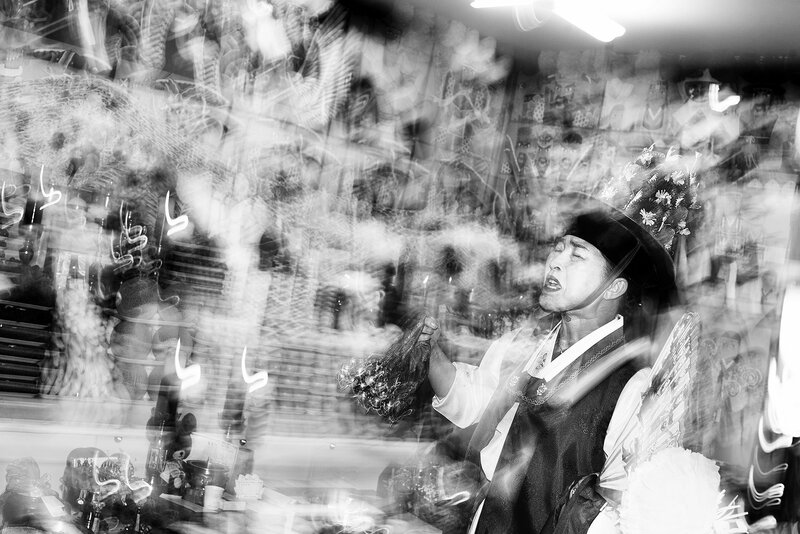 At the beginning of my field research on Korean Shamanism, I documented some rituals with a film camera. It quickly became clear that photography is appealing and fun for me. As a result, I have increasingly focused on photography. 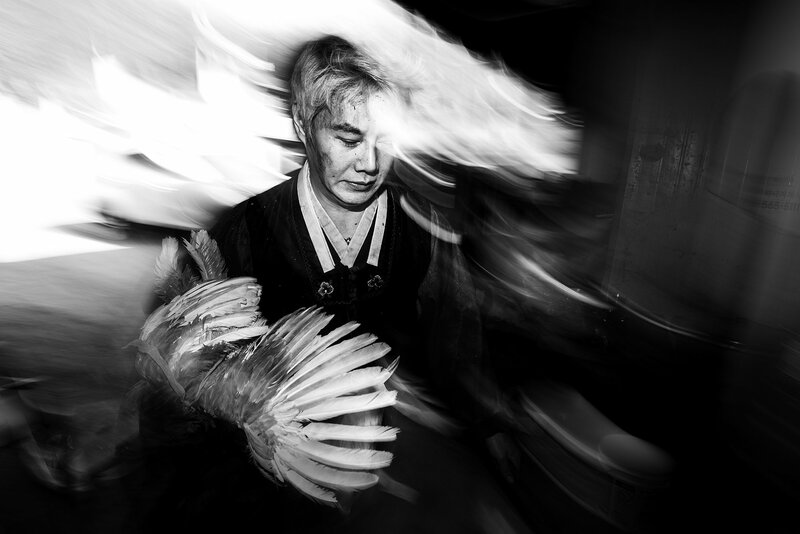 My encounters with Korean photographers then influenced me to decisively search for a visual language and for an appropriate form of representation of Korean shamanism. Can you please tell me a bit about the academic degrees you have and how they relate to your photography? I received my PhD. at the renowned Goethe University Frankfurt am Main in Germany. My thesis is about “Korean shamanism in the New Millennium”. In terms of content, I have on the one hand dealt with the various national variations of Korean shamanic traditions and on the other hand investigated the interaction of economic crisis and indigenous religion. My doctoral thesis on Korean shamanism is, in German-speaking countries, regarded as a standard work on modern Korean Shamanism. As an ethnologist, the camera is part of the working tool and was therefore always present. Besides, visual anthropology was already very important for my work and so I took every opportunity to photograph shaman rituals. At that time, I was still working with slide films and so my field research budget was quickly used up. Since my research was supported by the DAAD (German Academic Exchange Service) for 2 years, I was fortunately able to continue my photography. During this time, my attention has been drawn to the North Korean Hwanghaedo tradition. This ecstatic and wild shaman tradition fascinated me. 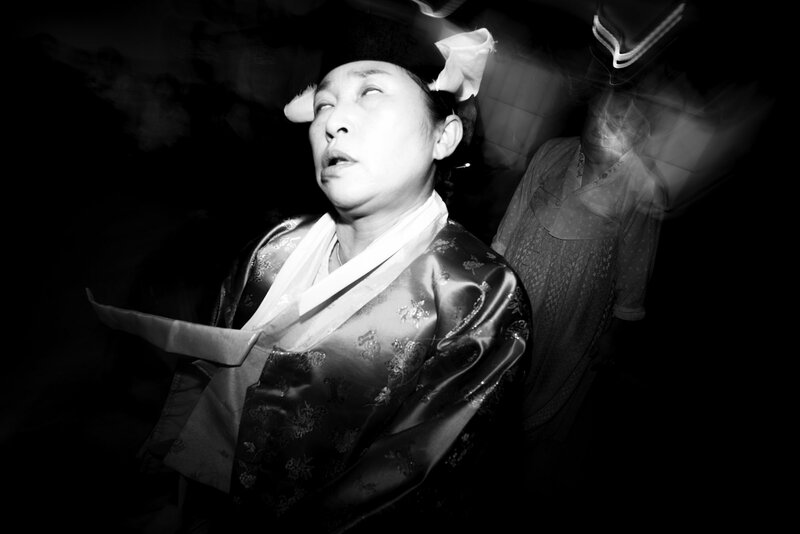 But the unbridled expression of spirituality seemed to be very unpleasant for many Koreans. Korean photographers and scientists were primarily interested in the issue of “shamanism and national identity” or researched/photographed classical subjects such as music, myth, performance, clothing, etc. The topic “altered states of consciousness” in the form of trance, ecstasy and incorporation of spiritual entities, for me the center of shamanic religious practice, was and is largely ignored. After my doctorate, when I had the opportunity to come back to Korea and work as a visiting professor at a university in South Korea, I saw the opportunity to start a new visual anthropological field research project and to focus on the ritual practice of the Hwanghaedo tradition. This turned into a long-term project, which I dedicated myself to as a scientist and photographer until today. How did the Institute for Korean Shamanism in Berlin come to be? What are your goals for it? After teaching at Korean universities for almost 10 years, my wife and I decided this year that we would go back to Germany. One of our thoughts is to build a shaman museum with a gallery. In the last 10 years, I have collected several trucks full of exhibits, like statues, instruments, altars, many paraphernalia, paintings and many other items. It started off quite harmlessly with a small gift here or a purchase there. But when I realized that many ritual objects were simply burned or thrown away, collecting became more systematic. The more I collected, the more older shamans gave me ritual objects. They recognized that the topic is important to me and is close to my heart. 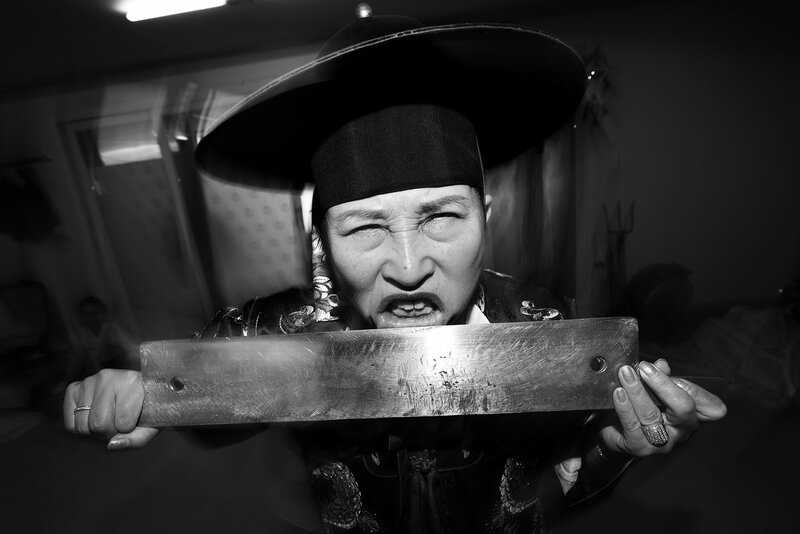 Especially the Hwanghhaedo shaman Han Gong-ju supported my collection and encouraged my vision of the shaman museum. The Institute of Korean Shamanism is a mix between a shamanic museum, gallery, science and photography. It will become the hub of all activities. The head office is in Berlin. We are just moving to Kreuzberg with the institute. This is perhaps the most multicultural part of the city in Berlin … maybe in Germany. For the moment we’re planning photo exhibitions, seminars and performances. As soon as we have a larger space, we will build the museum and invite shamans, scientists and artists. The goal is a small, but special Korean museum with a cultural center. The thematic focus is in particular on Korean shamanism and Korean spirituality but we are also open for art, music and lectures related to Korea or Asian spirituality. How has the study of Eastern spirituality affected your photographic work? Does this manifest in your photography in anyway? The study of Asian spirituality and the preoccupation with East Asian religions and world views probably influenced my photography only from a motivic and thematic point of view. For example, only if you know the symbolism of certain items or objects or the functions of some Gods in the extensive, shamanic pantheon, can you construct visual chains of associations and establish connections. But these are primarily intellectual aspects of photography, which in turn are only appreciated by recipients who are already very well versed in the subjects. Much more important for my photographic development was the discovery of East Asian aesthetics, which was the result of meeting Korean photographers and artists. I was not aware of the difference in perception and how much cultural identity influences our work. I mean that in either a positive and a negative sense. Visiting traditional concerts where I learned to love the sound of the haegum and the sound of the kayagum, Korean films that touched me because of their emotionality or the colorful, wonderful architecture of Korean temples are impressions that have shaped my ideas of Korean culture. My first encounter with the fabulous and famous photographer Kim Soo Nam was a milestone for me. Kim Soo Nam invited me home and showed me his work from several decades of photographing religious rituals in Asia and Korea. I was impressed by his diversity, style and dedication to his subject. 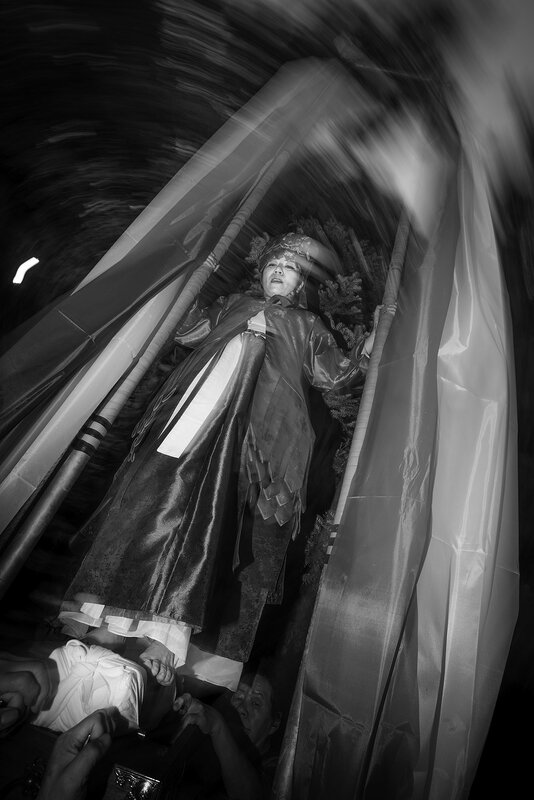 When I left his house that night, I had learned a lot about Korean photography and Korean shamanism. I bought all his books and spent nights studying his photographs. However, after a while I noticed that I was not the only admirer of Kim Soo Nam. Obviously, his photography has shaped and continues to shape generations of Korean photographers whose only goal seems to be to imitate Kim Soo Nam’s images. I noticed how clearly concepts of aesthetics in Korea are framed and defined. The longer I lived in Korea, the more often I had the feeling that I had already seen an exhibition. 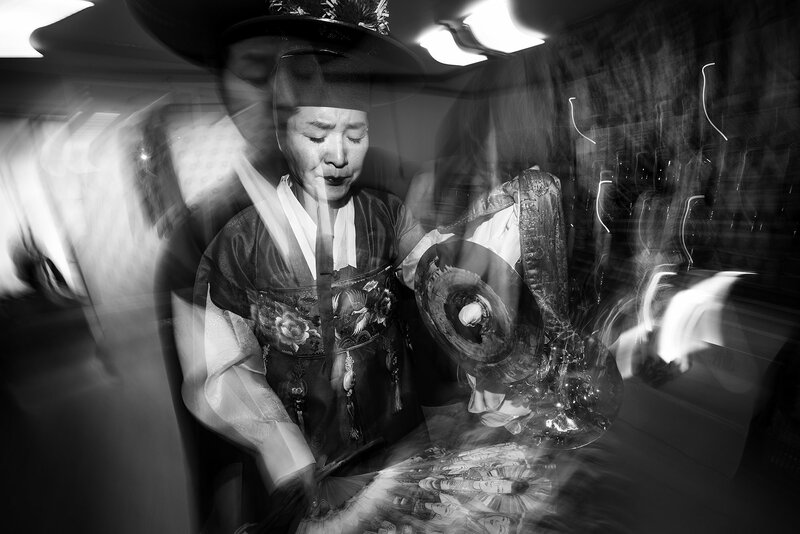 After a while photographs of Korean shamanism and Korean shaman rituals (gut) seemed to me like “trophy pictures”, like the infusion of a tea bag again and again. I didn’t want to work like this and so I started looking for my own project and found it in the spirituality of shaman rituals that was ignored by Koreans. Spirit contact (접신) and the idea of incorporation fascinated me. The resulting altered states of consciousness became the center of my visual anthropological work. In this respect, my photography has developed from the contradiction of fascination and demarcation to Korean aesthetics. How did you become interested and involved with the world of Korean Shamanism? The topics religion, shamanism and ritual interested me already during my studies. Before I came to Korea, I had already visited shamans, healers and gurus in other countries in Africa and Asia, photographing rituals there. It was already clear, so to speak, that my future research would go in this direction. Korea became interesting to me the first time I visited my parents-in-law with my wife. My first encounter with Korean shamans was in 2000 in the Chungcheongbukdo Province, it was unplanned and surprising. Attracted by the echo of drums and the sonorous sound of the taepyeongso, my wife and I suddenly stood in the courtyard of the very small Emileh Museum. There the death ritual (jinogi gut) was celebrated for the Korean folklore researcher and museum founder Cho Cha-yong. Fascinated we watched the colorful hustle and bustle of famous shamans like Kim Keum Hwa, Kim Gyeong Hwa and Kim Mae Mul, whom we had never heard of before. A large, hectic court of photographers and cameramen whirled around those shamans and left no doubt that they had to be “celebrities”. The excited participants of the ritual, the unusual music, the bizarre acts and the dances in traditional clothes created an extraordinary atmosphere, which quickly captivated me. We were immediately invited to be part of the ritual. We were served Korean rice wine and traditional food. The feeling to be welcome and to participate as a guest in the shaman ritual, which we did not recognize as a funeral service at first, has left a lasting impression on me. I knew straight away that I had my thesis topic in front of me. I remember this aha-experience as if it had been yesterday, because this ethnological “love at first sight” was so wonderfully combined with my interest in rituals, photography and Asian spirituality. Of course, I didn’t have the slightest idea that dealing with Korean shamanism would become a passion that has been affecting my scientific and photographic work for more than a decade now. Can you please tell us a bit about Korean Shamanism and your work regarding it? Korean shamanism is so diverse and exists in so many variations that it is difficult to “briefly tell you a bit about it”. At the beginning of my research, I travelled thousands of kilometers around the country to experience and photograph gut. Whenever I thought that I have seen almost everything, I was wrong, because there were always places, rituals and ceremonies that I hadn’t visited before. That hasn’t changed much so far. It seems to me to be an endless topic that is difficult to grasp in its complexity and its local variations. In this respect, concentrating on one tradition was an important decision because I was able to deepen my focus on the topic over a number of years, which has led to progress in my research. Concentrating on the Hwanghaedo tradition has also created a closer bond with shaman groups and individual shamans and created an intimacy that is reflected in my photographs. The aim of my scientific research is to document Korean shamanism in modernity, both in terms of preserving traditional elements and describing recent changes. I see it as a contribution to the research complex “Asian Spirituality” and “Ritual Research”. The visual anthropological work is the search for a new visual language (visual-anthropological aesthetics of religion) that moves between art and documentation, while doing justice to both aspects. When documenting rituals, what is the photographic process like? As a photographer, I am very active and I want to be as close as possible to the action. I participate in the ritual literally from the first to the last moment. Every moment is important to me. Of course, I’m waiting for the ecstatic moments, for scenes that are extraordinarily wild and expressive. 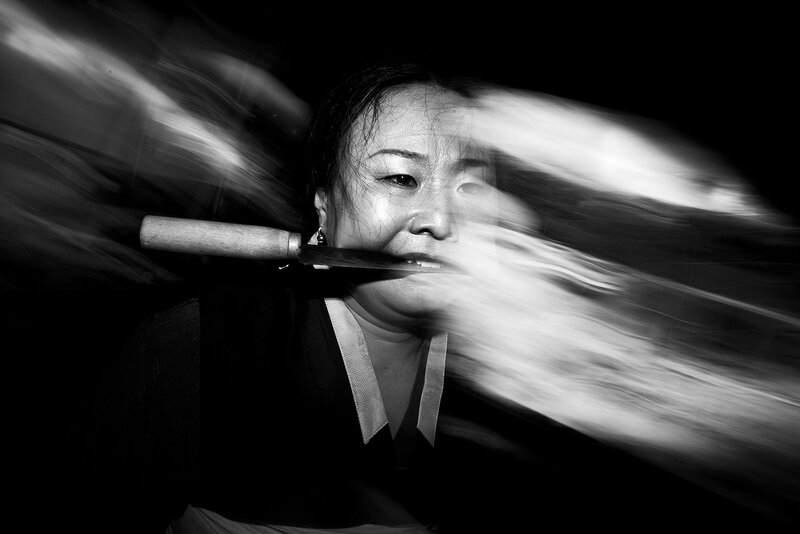 But Korean shamanic rituals are so varied, colorful and expressive that a mysterious picture can be hidden in every gesture, no matter how small. In intensive phases of the rituals, I experience trance-like states in which I forget time and completely dissolve into the process of photographing. For me, these are particularly beautiful moments of my work, which are usually crowned with great photos. I always thought about whether science, art and photography do not exclude or even hinder each other in my work. Nowadays these thoughts are meaningless and no longer relevant to me. You can photograph artfully and still be a good scientist. This is ultimately not a contradiction but a gift. Photography has a lot to do with technology (whoever is denying this has no idea…) but above all photography is passion and expression. What others think about your topic matter is of no importance. Do what you want.